There is no simple explanation for the perennial ryegrass persistency issues seen on some farms, and some paddocks in the upper north Island. Sometimes complex problems are only resolved by ruling out some of the factors that could be involved, and concentrating on those that remain. Trials comparing five sowing rates at three sites over five years, showed that different sowing rates had no effect on subsequent ryegrass survival. Four cultivars of perennial ryegrass were sown at five seeding rates (equivalent to 6, 12, 18, 24 and 30 kg ryegrass seed/ha) with clover in three regions, over five years. While the seed rate treatments led to different pasture structure (a relatively small number of large plants in the low rate treatments versus a relatively dense population of smaller plants at the high rates), there was no evidence that this had any effect on subsequent ryegrass survival. Sowing rate is not the problem. Sowing old cultivars (e.g. Nui) alongside new cultivars showed that new cultivars were no less persistent than old cultivars when it came to survival. The fact that old pastures are persisting and productive; on many farms, whereas new pastures (sown to new cultivars) are often failing, could be an indicator that soil disturbance is a factor, since the soil has not been touched in the former, but will have been through some form of cultivation in the latter. Several experiments where old cultivars (Nui, and others) were sown alongside new cultivars, (at the same sowing rates, soil preparation etc. ), have shown that the new cultivars are inherently no less persistent than Nui when it comes to survival. On other occasions, when we have used commercially-available Nui seed, Nui survival has been poorer than survival of new cultivars because commercial seed lines often contain very low endophyte infection levels (even though they may be marketed as having standard endophyte) and so have no protection against insect pests. We’ve looked at whether the genetic make-up of the survivor populations has changed over time in pastures sown to Nui versus new cultivars. Again, we see no evidence at all that this is happening. So, we conclude that plant breeding for increased yield has not been at the expense of the ability of plants to survive in grazed pasture. Provided pastures are managed within current recommended guidelines for e.g. pre-and post-grazing pasture mass and removal of surplus feed as silage etc., there is no reason to believe that a system based on high rates of imported supplement and a high stocking will be any different in terms of persistence risk from a system based on low rates of imported supplements and a lower stocking rate. High input systems may have more levers available to prevent over-grazing (especially if they include a feed pad or stand-off area), however all the tools are there to also prevent over-grazing in a low input system. DairyNZ wants to support farmers in the upper North Island affected by the poor persistence of perennial ryegrass-based pastures, so that they can consistently increase the amount of home-grown feed. We have chosen to focus on a particular district (Hauraki-Matamata-Piako), given the severity of the issue in this area, the presence of motivated farmer focus groups (P3 Trust Hauraki Monitor Farms) and the existence of other projects related to environmental management. The purpose of this project is to look at the climatic stress on pastures. Example of spatial data. Moisture deficit. Gathering spatial data on likely environmental drivers of poor or variable pasture persistence e.g. soil type, climate data, pest populations. Gather on farm data including best and worst performing paddocks, farm system information and paddock history. 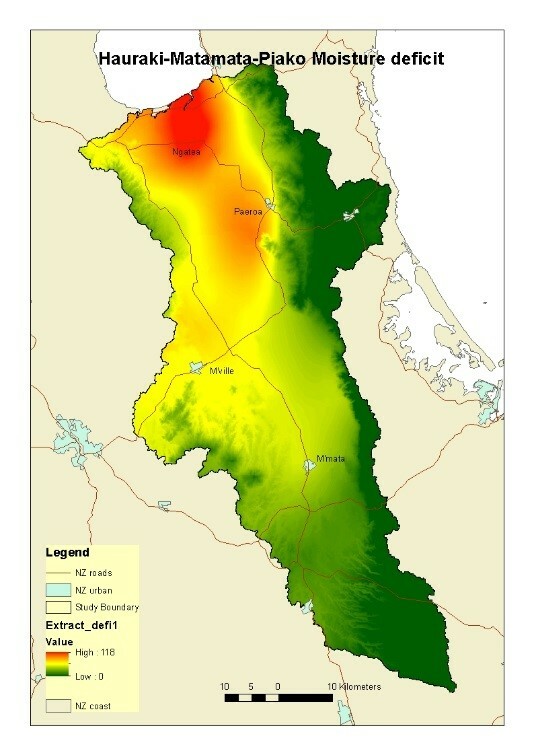 Run The Pasture Growth Forecaster to identify zones where the environmental drivers put the most pressure on pastures. Data analysis to generate some clear hypothesis around persistence based on patterns observed. Poor persistence commonly refers to the loss of plants leading to the invasion of weeds and reduced productivity. This page will help you understand and reduce persistency problems in your pasture. Poor persistence of newly- sown perennial pastures is a costly and frustrating problem for some many farmers in the upper north island , particularly in Bay of Plenty. Find out about the species interaction trial at Scott Farm established in autumn 2012.